^ a b Anne M. Todd; Rose Blue; Corinne J. Naden (1 January 2009). 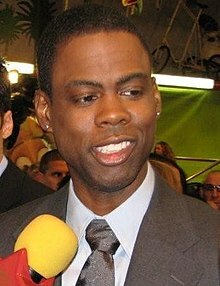 Chris Rock: Comedian and Actor. Infobase Publishing. ISBN 978-1-4381-0074-6. ^ a b c Chappell, Kevin (October 1999). "Bigger, Better, And Hotter! Chris Rock Talks About Fame, Controversy And The Challenge Of Being No. 1". Ebony. Archived from the original on 2005-04-05. Retrieved June 9, 2010. ^ Roberts, Andrew (November 1, 2014). "The Story Behind Chris Rock's Firing From 'Saturday Night Live'". Uproxx. Retrieved 5 November 2015. ^ Fallon, Kevin (June 14, 2015). "The Secrets of 'Saturday Night Live': Where Comedy Legends Are Born". The Daily Beast. Retrieved 5 November 2015. ^ a b Roberts, Andrew (2014-11-01). "The Story Behind Chris Rock's Firing From 'Saturday Night Live'". Uproxx. Retrieved 2016-09-22. ^ Cormier, Roger (2015-04-15). "22 Things You Might Not Know About 'In Living Color'". Mental Floss. Retrieved 2016-09-22. ^ Wagmeister, Elizabeth (October 30, 2016). "Netflix Nabs Chris Rock for Two Comedy Specials in $40 Million Deal". Variety. Retrieved 22 November 2016. ^ Nellie Andreeva (2016-10-30). "Chris Rock Returns To Stand-Up In Big Deal With Netflix For 2 Comedy Specials". Deadline Hollywood. Retrieved 2016-10-30. ^ Abad-Santos, Alex (29 February 2016). "Oscars 2016: Chris Rock dismisses Oscars boycotts in a surprising, political monologue". Vox. Retrieved 29 February 2016. ^ "'Hollywood IS racist': Chris Rock skewers his Oscars audience and killer cops in rip-roaring monologue but saves his real scorn for the boycott brigade". Daily Mail. 29 February 2016. Retrieved 29 February 2016.